You must be living under a rock to not have heard of the brand Glossier. It's all over Instagram, YouTube and blogs and as curious as I am I wanted to see what the fuss was about. Luckily for me I went to New York -read about what I did there here- so of course I popped into their showroom in Soho. Glossier is founded by Emily Weiss from the website Into The Gloss. Also remember Emily the super intern from The Hills? She was interning in New York and helped Lauren and Whitney in LA with a Teen Vogue event. She is the same Emily! I thought that was so funny! Before going to the store I did some research online on what kind of products are worth it and which ones are not. Glossier is mainly focused on people with pretty good skin that is a bit dry. Hence the name Glossier aka glossy, glowy skin. Since my skin is more on the oily, acne-prone side most products are not targeted for me, but I still was like why not have a cheeky look and pop in for a lip balm? Because you can never have enough lip balms. The Glossier Showroom is located on 23 Lafayette St. An elevator will take you up where you enter a room for beauty lovers. All products are displayed and you can try them out as much as you like. The concept is that you write down whatever you want on a Glossier sheet and then go up to the cashier or one of the Glossier ladies and order your goodies. A few minutes later someone calls for your name and there you have it: your own cute Glossier bag. I had a look at the oh so popular Balm Dotcom ($12/15ml), a multipurpose lip balm, and tried them all out. In the end I went with the plain, unscented one, because I felt like I would use that the most. I also ordered Super Pure, one of the three Glossier serums. Super Glow and Super Bounce are more oriented on dry, dull skin and Super Pure has zinc and vitamin B3 and is supposed to calm redness and break-out prone skin. With $28 it's on the pricier side, especially since you only get 15 ml, but I wanted to give it a go to see if it would really cure my skin. 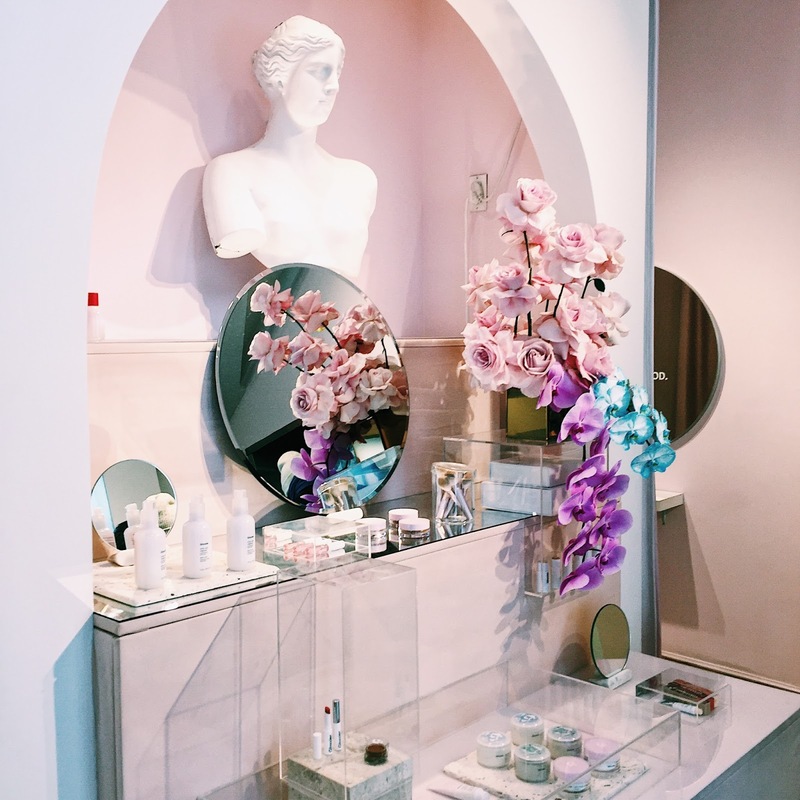 Overall I do like the Glossier shopping experience, it's a bit different than your usual Sephora run, but I liked it. The goodies that you buy are packed in this pink packaging and it gives you this luxury, cool gal feel. The store can be a bit small and is usually packed with other girls who love trying everything out. I went on the weekend too, so maybe try going there on a weekday to avoid crowds. Or order online if you live in the US, Canada or UK. I still need to test out the Balm Dotcom and Super Pure serum, but when I do a review of these babies will go up ASAP. Just in time for my next trip to the Glossier showroom in May! Haven't tried anything Glossier because I do not believe they ship to Australia :( But when they do I'd be keen to try their Milk Jelly Cleanser!